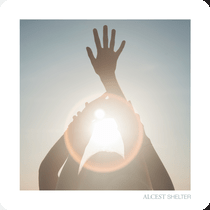 I’m not sure how one could describe the music of the French duo Alcest. Maybe “ambient metal” – maybe “nouveau dark metal shoegazers”. Maybe neither is fair. But there is an interesting cross-pollination of the two genres, to be sure. Opening with a dramatic, quasi-religious sounding fanfare called “Wings”, Shelter is quite melodic and warm. “Opale” is a sweet-with-some-grit number, filled with harmonies, tunefulness and a great beginning. “La Nuit Marche Avec Moi” reminds me of vintage Cure mixed with The Church (albeit sung in French) – poppy, not dirgey and strong. “Voix Serenes” is simply gentle and beautiful. The title track, “Shelter” immediately reminds me of The Chameleons and is probably my favorite of the eight songs. All in all, I am very pleased by this record and it would be a good thing for you to check this out and give it a place in your heads.